Radio City Music Hall is an entertainment venue located in Rockefeller Center in New York City. The building was designed by architect Edward Durell Stone and interior designer Donald Deskey in the Art Deco style. It was a project of John D. Rockefeller, Jr., Samuel "Roxy" Rothafel and RCA (Radio Cooperation of America) chairman David Sarnoff. The Music Hall opened on December 27, 1932. Originally it was a hall for stage shows. On January 11, 1933, the Music Hall converted to a film theater with a spectacular stage show perfected by Roxy. The first film shown on the giant screen was Frank Capra's The Bitter Tea of General Yen. 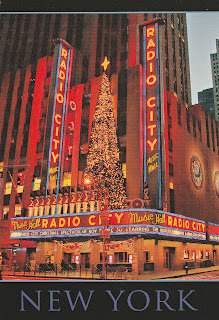 Radio City Music Hall became the premiere showcase for films from the RKO-Radio Studio. The film-plus-stage-spectacle format continued at the Music Hall until 1979, with four complete performances presented every day. Radio City Music Hall has 5,933 seats for spectators, and additional seating can be placed on the pit elevator during events that do not require that space bringing the seating capacity to over 6,000. It became the largest movie theater in the world at the time of its opening. Now the focus of the theater is on concerts and live stage shows, movie premieres and feature runs have occasionally taken place there such as the Harry Potter film series. I got this postcard via Postcrossing. The photo was taken in Christmas time and advertises The Radio City Christmas Spectacular, an annual Christmas stage musical and Christmas tradition since 1933. I love the surreal reality of cinemas, a familiar place that sends me to strange places, a journey into the world and into me. This adventure starts around the corner.